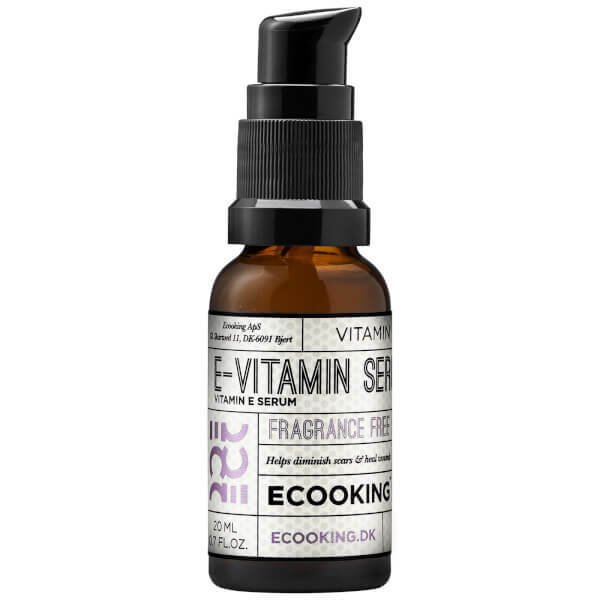 Discover the benefits of the Vitamin E Serum from Danish skincare brand, Ecooking. The multi-purpose miracle formula delivers a healing effect and provides superior antioxidant properties. Ideal for use on wounds, scars, tattoos, sun damage and very dry skin. Deeply moisturising and hydrating, the lightweight, non-greasy serum absorbs quickly to address a host of skincare concerns. Suitable for all ages. Pump a suitable amount of serum onto the fingertips and apply the serum onto the face, neck and décolleté. Cyclopentasiloxane, Ethylhexyl Cocoate, Dimethiconol, Glyceryl Linoleate, Glyceryl Linolenate, Tocopheryl Acetate**, Dimethylmethoxy Chromanol, Ceramide NP, Phenoxyethanol.